Freddie Fox as Bosie, Cal MacAninch as Robbie and Rupert Everett as Oscar Wilde. The Judas Kiss, a play written in 1998 about a story more than a hundred years ago, gets a revival at the Hampstead theatre and although the production doesn’t try any new tricks, the experience is full blooded and rich, the performances first rate. 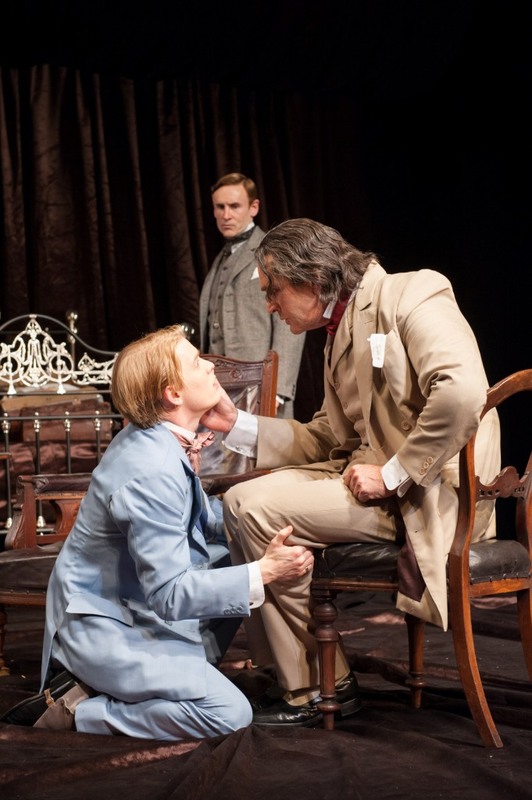 The play recounts two significant events in Oscar Wilde’s life: his decision not to flee London when his arrest was imminent and his break up from Bosie (or Lord Alfred Douglas) a few years later. Saying the play is about homosexuality is shallow. Saying that it isn’t might be glib. Are we more advanced today? Ultimately, love in this play is controversial and destructive because all love is. For me the star of the show was David Hare’s text. Dense but playful, quick but truthful, it balances wit and pathos without letting down either side. Neil Armfield‘s direction lets the text breath and show its colours, and in the end these are all the colours the productions needs. In addition to the text, I loved the performances of Freddie Fox as Bosie and Cal MacAninch as Robbie. Freddie Fox’s Bosie is all mouth (lips, voices, words, kisses), he constantly walks a tight rope between devotion and deceit and is often truthful for both things at once. Cal MacAninch as Robbie Ross is a quieter presence but no less interesting: his earnestness is complicated, tinged with regret, memories and unfulfilled promises. When Wilde says “you were the first man I slept with”, we can see the attraction. What happened to the characters in Jez Butterworth's Mojo?